Take advantage of their great welcome bonus, every deposit is tripled during your first 7 days at the casino with their unlimited 200% bonus. This bonus comes with one of the best wagering requirements I have seen from RTG casinos, especially for a 200% bonus, at deposit + bonus x20. Withdrawals are processed very quickly once your account is verified. On top of that great welcome bonus, you will also enjoy many weekly bonus offers and free chips. The more you play at the casino, the more free stuff you will get. They also have a great loyalty program with redeemable points that grow as you play. You can redeem those point for cash once you’ve accumulated a certain amount. Try your luck at the numerous slot games that pay random jackpots! 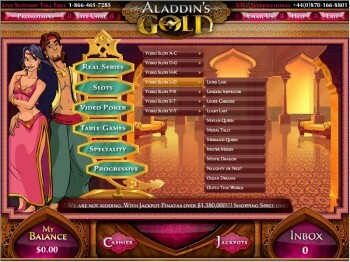 The Real Series of video slots feature games with paylines ranging from 20 to 50 lines, great bonus rounds and free spin features, and random jackpots ranging from $1k to over $20k that can pay after the completion of any spin regardless of what lands on the reels (of course chances of winning these jackpots increase with bet size). Some of the games with larger random jackpots have fixed bet sizes of $1-$2 per spin so everyone has the same chance of winning. The live help from customer service is always quick to respond and happy to assist with any question or concern you may have. Whether it’s a very important issue, or just a small question, they are there to help you 24 hours a day and 7 days a week. Aladdin’s Gold Casino uses USD as currency, but still accepts Instadebit from Canadians as a deposit and withdrawal method for our convenience. Sign up today and triple your chance of winning on every deposit during your first week.